An approved DOT 7A Type A shipping container, the S300 POC (pipe overpack component) is a shielded version of the standard pipe overpack. It consists of a 12-inch diameter pipe component positioned within a 55-gallon drum by means of fiberboard/plywood dunnage, and neutron shielding materials placed inside the stainless steel pipe. The overall height of the pipe component is 27.5 inches with a 12.7-inch outside diameter. The pipe component is placed in a 55-gallon drum with the final assembly weighing 429 pounds. The pipe component body, lid and bolt flange are constructed of stainless steel. A butyl rubber or ethylene propylene O-ring is required for pipe component closure. 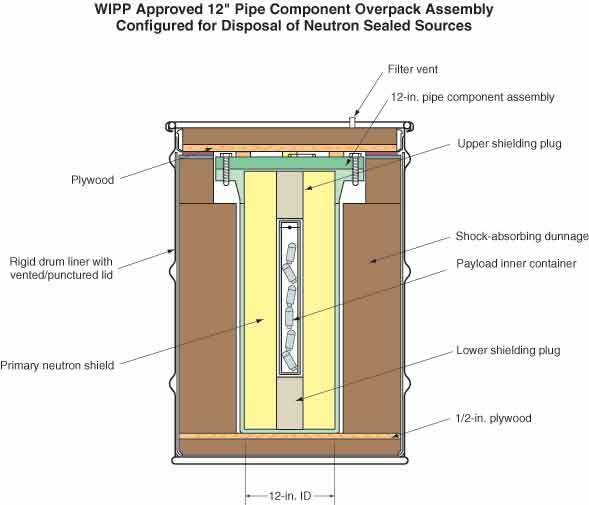 The S300 container was designed to affect a higher packaging efficiency for neutron emitting sealed sources than could be achieved in the standard pipe component container designed and approved for use in support of the Rocky Flats closure efforts. The container utilizes high density polyethylene neutron shielding inside the stainless steel pipe which reduces external neutron dose equivalent rates per unit activity in the container. This allows container loading with a greater Curie content while maintaining compliance with external dose rate limitations for both packaging and disposal. An application to use the S300 specifically for fissile sources was submitted to NRC in August 2006. Tha application was approved and the S300 is now certified as a NRC-approved Type AF package (for fissile material) in addition to it's certification as a standard DOT 7A Type A package. An IAEA Certificate of Competent Authority was also approved by DOT for international shipments of fissile sources in the S300. The NRC and DOT-issued IAEA Certification No. is USA/9329/AF-96. Performance or procurement details are available from the OSRP staff, simply contact Justin Griffin at 505-606-0362.